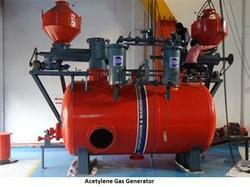 We are the leading manufacturers of Acetylene Gas Generator. We are leading supplier & distributors of Acetylene Generator. The Acetylene Plants manufactured are incorporated with modern and up-to date technology and completely automatic in operation. These plants are made as per International Standards and duly approved by the Chief Controller of Explosives, Nagpur and certified by the Bureau of Indian Standards. 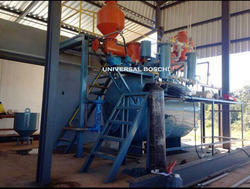 The medium pressure UA Acetylene Generator is stationary carbide to water automatic generator with twin hoppers. Acetylene is generated as a result of the chemical reaction between calcium carbide and water. The generator is designedto generate acetylene at a pressure of 7 psi. We are the leading manufacturers of Acetylene Generator. We manufacture the Acetylene Plants a stationary, Low pressure & medium pressure, Carbide to water, With automatic Controls and Safety devices.